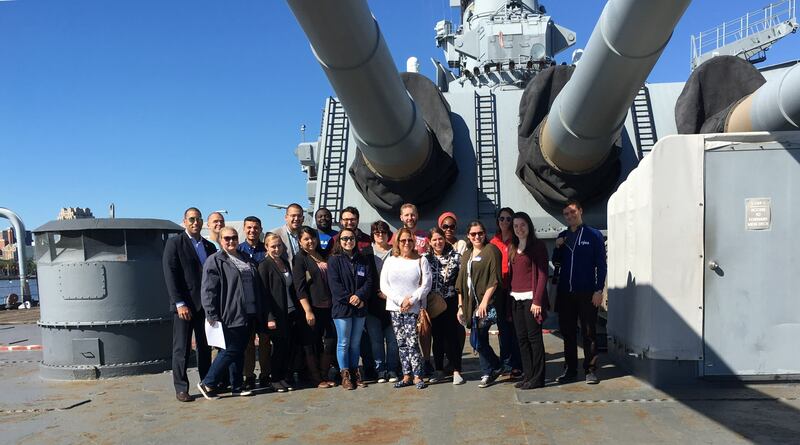 Members of the NJEA early career network joined NJEA Preservice on Oct. 1 for an event aboard the Battleship New Jersey. The event, “Blast into Advocacy,” drew members from across the state who were ready to become advocates for public education. NJEA Preservice President, Jessica Quijano welcomed members to the event. 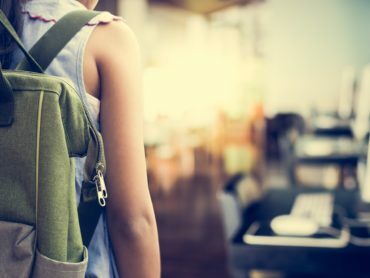 “There are many battles ahead as we fight to protect public education.” NJEA Vice-President Sean M. Spiller reinforced the importance of electing a pro-public education governor in November. 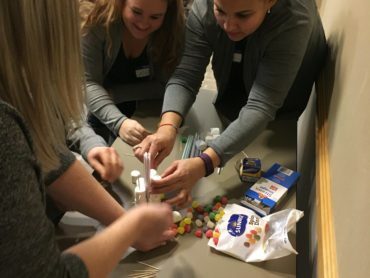 After a tour of the battleship and a lunch & learn hour themed around building connections, four early career members spoke about the battle ahead. Peter Creekmore of the Greater Brunswick Charter Education Association spoke about how to bring social justice work into your classroom. Andrew Lewis of the Old Bridge Education Association shared NJEA’s Degrees Not Debt campaign to help members with the burden of student loan debt. Brian Rock of the East Orange Education Association encouraged members to get out the vote for Phil Murphy and NJEA’s endorsed candidates in November. Finally, Hannah Pawlak of the Highland Park Education Association spoke about the social justice organizing work she is doing around immigration. Members were encouraged to bring nonperishable canned food for donation to a local food bank. Those who participated were entered into a drawing to win an Amazon Echo. Marie Battist Celestin of the Millville Education Association was the lucky winner. Marie plans to “blast into advocacy” by canvassing and phone banking for NJEA’s endorsed candidates. Marie isn’t the only member who will be blasting into advocacy this year. NJEA Preservice member Ellen Bacon of the Seton Hall chapter plans to form coalitions with other campus groups. NJEA Preservice member April Licato of the Rowan University chapter plans to learn as much as she can about issues so she can present them to her campus and community, and Colleen Curren of the Black Horse Pike Education Association will be blasting into advocacy by getting involved in the Senate race in Legislative District 3 to elect Fran Grenier.